July 11, 2016 By Christina Leave a Comment This post may contain affiliate links. Read my disclosure policy here. I have 2 sons, age 2 and age 1. We have regular pediatric check-ups every 3 months for the first 18 months and then every 6 months thereafter. Our pediatrician (who I adore by the way) has recommended our now 2-year-old see a dentist. Yet another appointment to try to schedule in our busy lives. Recently I was informed that there is a VERY important doctor we should have done with our boys. 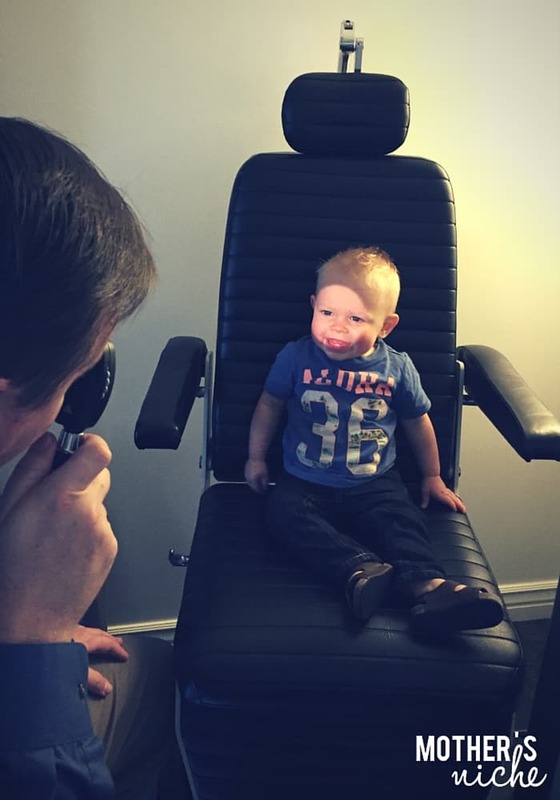 The American Optometric Association (AOA) recommends that infants have a comprehensive eye assessment between 6-12 months. Wait, what?! 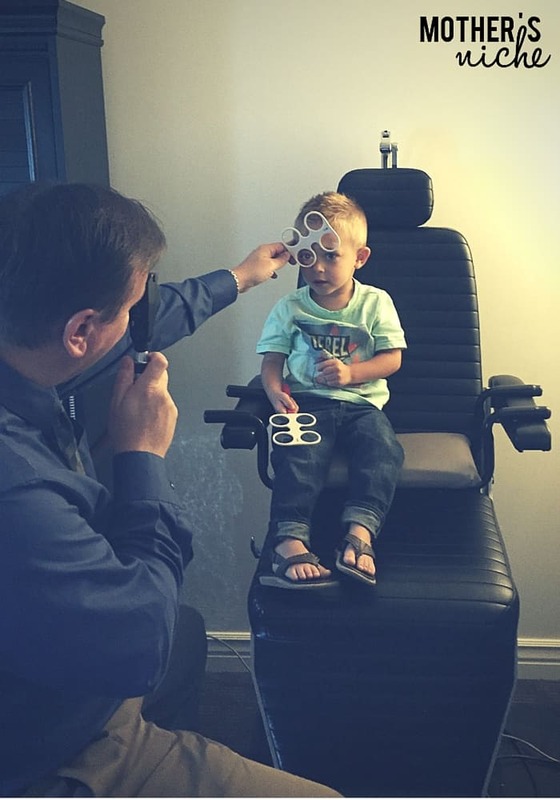 I have taken my two children to every well-child check-up since birth, but never has an eye assessment been brought up. Having grown up with vision problems myself, I was concerned when I read this. There is a higher likelihood that my children will have nearsightedness as well, and it made me worry that we would not find out until they were in school and came home one day and told me they couldn’t see the board. My two-year-old certainly cannot communicate that he is struggling to see something clearly. 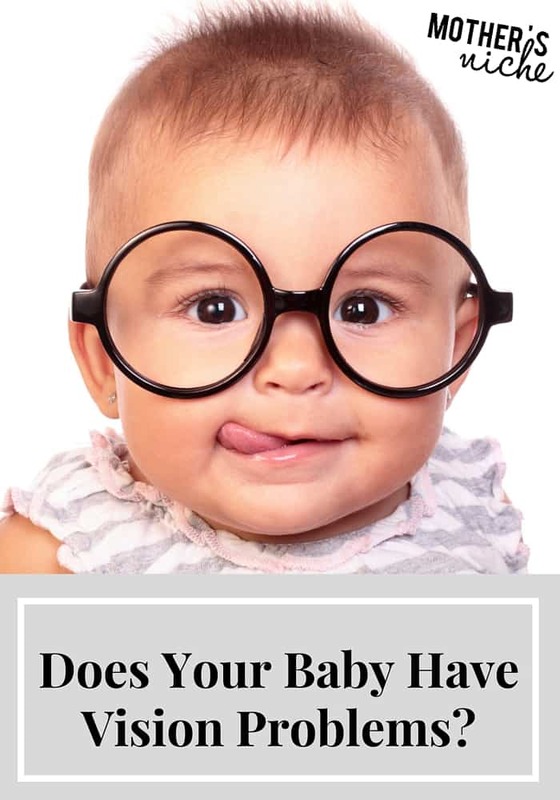 The assessment with my 1-year-old was fairly basic and mostly looking into his eyes and verifying that his eyes were physically in good shape, i.e. checking the nerves inside his eyes, checking for abnormalities. The optometrist could also use light (as you can see above) and check the focus of the reflection to get a fairly good estimate at how clear his vision was. I had no idea! My only experience with eye exams was needing to be able to read an eye chart, so I had no idea what it would look like for a 1-year-old. With my 2-year-old, he could do a little more comprehensive exam. He did the same, checking the physical makeup of the eye and he could get a better look with him sitting still better. He used lenses again to check the reflection and focus to be able to determine clarity of vision. He also had a book of shapes and 3-D glasses that allowed him to find out if he had a lazy eye. When my son could see the shapes that let him know both of his eyes were working in conjunction and therefore no lazy eye. He really had fun playing with all the little lenses and the doctor had plenty of little videos for him to watch and look in the direction the doctor needed to see all the parts of his eyes. I asked the doctor at the visit if there are things that parents can do that help children’s vision, and things to avoid that hurt vision. Babies are not born with 20/20 vision. It has to be developed. That made sense to me, but wasn’t something I naturally assumed. They can develop their vision through play where we practice skills like eye focusing, hand-eye coordination, vision and balance, and visualization skills. Any games or activities involving hand-eye coordination are good for developing the skills needed later in school. Good nutrition is certainly important as well. Things that can harm vision development are too much screen time and even too much reading, (due to the fact that the eyes are focusing for long periods of time, up close). Balance and moderation is the key. Having these eye assessments are so important because there is more to vision than just 20/20 eyesight. 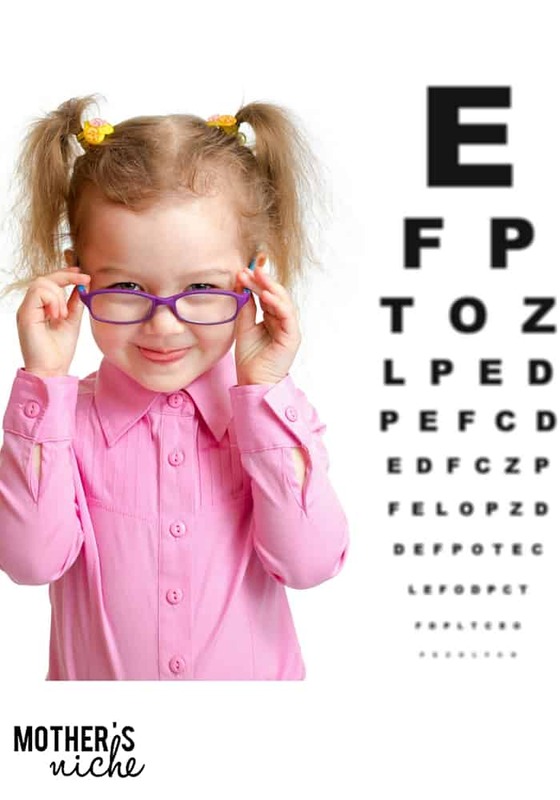 There are a number of children that struggle to read or learn because they have a variety of vision problems other than just nearsighted/farsightedness. So often these problems go undiagnosed for so long. We may think our child just hates reading when in fact there is some kind of vision problem. There are so many tools doctors can give us, (this doctor even mentioned if nearsightedness begins they can now reverse some of the effects with exercises and eye drops) but they can only do so if they are seen by a doctor of optometry. Parents should look for any signs of eyes crossing or wandering. Other things to look for are any differences in the red-eye reflex in photos — this can often be a sign of a vision imbalance or something more serious like eye cancer. Vision problems in infants are rare, but parents should still look for the following signs that indicate eye health or vision issues like: Excessive tearing, red/encrusted eyelids, constant eye turning, extreme sensitivity to light, and an appearance of a white pupil. Please check out the InfantSEE® website and check out some of the questionnaires and evaluations to see how your baby is doing. Make an appointment for your baby or child to be seen. It was very educational for me and will certainly benefit you and your child. What suggestions do YOU have regarding children’s vision?? ?